Add some homemade sparkle to your Christmas tree with these salt dough ornaments - a really easy recipe that children will love to lend a hand with. 1. Combine the flour and salt in a bowl, and add the water. Mix to a dough-like consistency, turn out onto a floured surface and knead. If it is too sticky, add a handful or two more of flour. 2. Still on a floured surface, roll dough to about a 1/2cm thickness. 3. We achieved a patterned effect on our finished ornaments by rolling a doily over the dough before we cut it. You could also try old lace, leaves or anything else with an interesting texture. 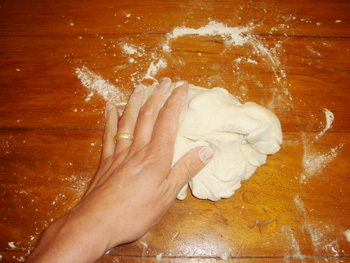 Simply place textured item on top of flat dough and gently roll with a rolling pin. 4. Cut dough to desired shapes with cookie cutters and make a hole in each shape with a straw. 5. Place shapes on baking paper on a baking tray, and bake at 100 degrees celsius for two hours. Turn shapes after one hour in the oven. 6. Paint once cooled. Metallic paints (we found some great ones at Warehouse Stationery) work best for shiny ornaments, or you could try sprinkling over glitter while paint is still wet. 7. Thread with string, twine or ribbon, and hang.